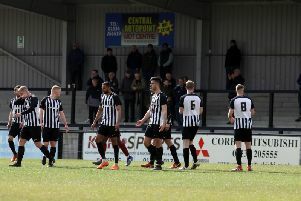 Steve Kinniburgh is confident his Corby Town squad can cope with the busy schedule that awaits them in the final few weeks of the season. The Steelmen are set to play for the first time in three weeks at the weekend when they take on Gresley FC at Steel Park as they bid to keep their play-off hopes in the Evo-Stik League South alive. Having been ahead of schedule with their fixtures, Corby are now facing the prospect of playing their final 11 matches in the space of six weeks. They were without a game last weekend before Tuesday’s clash at Cleethorpes Town was postponed due to a waterlogged pitch. Despite there being some frustration at their recent inactivity, Kinniburgh is now expecting to have a full-strength squad to choose from for this weekend. And the caretaker-boss insists every player will have a key role during the run-in. “It’s getting to that stage of the season where time is running out to get all the games in,” he said. “We are starting to get a bit of a backlog but hopefully we won’t have any trouble in getting the next couple of games on. “We are fortunate that we have a pitch that doesn’t have many games called off. “The games have built up a bit but I am confident we can cope with that. “We are coming into the busy period fresh and we have bodies coming back from injury as well. “By the time Saturday comes around, I think we will have a fully-fit squad to pick from. Corby's home clash with Kidsgrove Athletic, which had been originally been penciled in for next Wednesday, has now been switched to Monday, March 26 (7.45pm) while they now head to Cleethorpes on Thursday, March 29. And Kinniburgh knows his team's form at Steel Park will be key if they are to make a late surge for the top six. “If we are going to stay in the running for a play-off place then our home games are going to be massively important,” he added. “It won’t be easy on Saturday because Gresley are fighting to stay in the division. But we are in the driving seat as far as being at home is concerned."